Happy Monday everybody! I know, I've been the worst book blogger ever and I haven't been posting consistently. This year has been hard on me, and I noticed that I'm not going to have enough time to bring out posts every single week. Right now, I'm aiming for at least one post per week but even that's not 100% completely manageable. But for today's post, I wanted to take a break from talking about all things books. 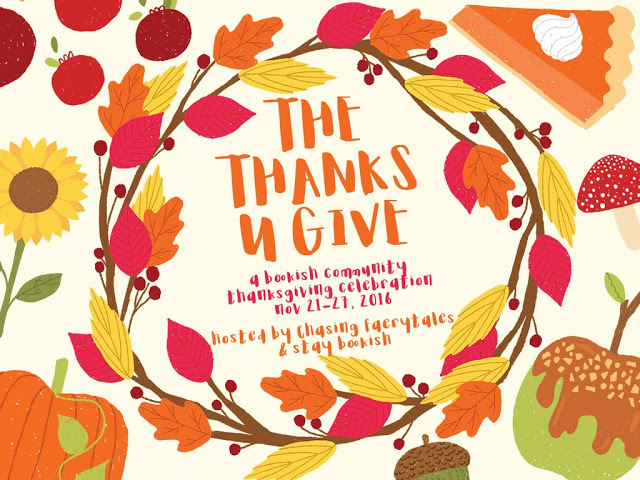 Created by Mishma @ Chasing Faerytales and Hazel @ Stay Bookish, The Thanks U Give is an event running from the 21st of November to Thanksgiving day where bloggers can sign up and spread love throughout the bookish community. I was especially eager to sign up because Thanksgiving is one of my favorite holidays, and I thought it was time to give back to this wonderful community that I've been apart of for about three and a half years now. YOU | I am incredibly thankful to everyone who has ever visited my blog before. If you read, comment or share my posts, I am extremely grateful. Today is a day of giving thanks. I know that by the end of this post you'll be tired of hearing the world 'thankful', but there are really not enough words or thank you's to give you for your support. To all my followers and readers, you have given me something to come back to. To all the friends I've made since day one, you have inspired and taught me to become better and better every day. I love you. PUBLISHING COMPANIES | There's too many publishing companies to name that have trusted me to promote and review their books. When I first started blogging, I had no idea that there was a business side to all of it. Fast forward to when I emailed my first publishing company, and from then on I've had the courage to ask more and more. I'm so grateful for books that they send to me and even ones they send me earlier than the release date. It means so so much. This actually doesn't only apply to publishing companies, but to all companies in general that I've gotten to work with or have personally reached out to me! AUTHORS | Of course, where would we all be without authors? I am thankful for the time, blood, sweat, and possibly some tears that are put onto your pages. I am thankful to all authors, ones I've met and ones I haven't. Authors, near and far! You are the foundation that holds bloggers, readers, publishers and fangirls/fanboys together. GIRL IN PIECES BY KATHLEEN GLASGLOW | I'm thankful to all the books I've ever read for entertaining and teaching me, however, there's one book that I have to get down on my knees and worship. That book is Girl In Pieces by Kathleen Glasgow. Never have I read a book that resonates with me as best as GIP did. A book that understands me to my deepest core. It was like this book was taking my body and mind apart and putting it back together again in a story. Shortly after reading GIP, I was inspired to become someone different. I said, "hey this main character can do it, so can I!" Thank you Kathleen Glasgow, for being brave enough to write that story and for teaching other young girls and boys like Charlotte that there is hope!